Je’Rod Cherry, right, signs autographs at the Buffalo Bowl, a five-on-five flag football tournament sponsored by 909 Student Ministries, the youth ministry at Community Grace Brethren Church (Tom Abbitt, pastor), Warsaw, Ind. The event, where Je’Rod shared his testimony, was held Saturday, October 18. Community Grace Brethren Church’s youth pastor Tim Clothier estimated about 100 teens and adults attended the outreach event. Each winning team member received a football autographed by Je’Rod plus a $25 dollar gift card. 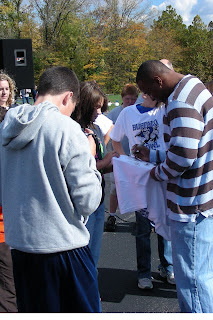 Je’Rod is a former New England Patriot and holds three Super Bowl rings from his time playing with the team. Last summer, he and his wife, Samua, decided to sell one to help needing children around the world. They made the decision while attending Momentum East, the annual youth conference of the Fellowship of Grace Brethren Churches (and sponsored by CE National). They were attending the conference with the youth group from their church, Grace Church, a Grace Brethren congregation in Macedonia, Ohio. To date, more than $70,000 has been raised. To learn more about his efforts to raise funds for Asia’s Hope, Feed My Starving Children, and other charities, click here. For more information about the raffle, see Celebrities for Charities. The deadline to purchase tickets for the raffle is November 27. For a recent story in the Washington Post about Je’Rod’s efforts, click here.